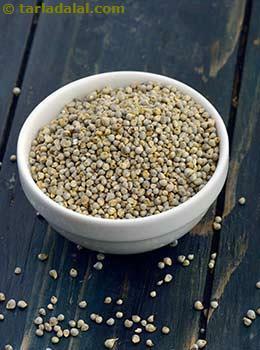 Commonly known as pearl millet, bajra is one of the most widely grown varieties of millet. The glycemic index of bajra is 54 and the glycemic load is 6.06 which makes it a low glycemic load range cereal. It is a great option for people who are intolerant to gluten. Thus ideal for gluten free diets. You can also use bajra in a khichdi in combination with dal instead of using rice.it is also a alkaline rich food and manages your acidity. Is Bajra safe for diabetics? Since bajra is a whole grain it creates a much lower rush in blood sugar levels as compared to bajra flour because it is processed to some extent. Also the glycemic load of raw bajra is only 6.06 which does not let the blood sugar levels fluctuate and hence good for Diabetics. It is very crucial to understand the amount of carbohydrates consumed per meal. That will help ultimately in controlling your sugar levels. The insoluble fiber present in bajra helps in easy bowel movements and hence relieves constipation. Magnesium present in bajra improves insulin response and thus lowers insulin resistance. When combined with any other pulse, it forms a complete protein. Is Bajra suitable for weight loss? The high fiber content (3.3) of raw bajra of 1/4th cup (approx 30 grams) do not let you feel hungry for a longer period of time. Thus controls your appetite. You can have it in the form of healthy Bajra khichdi combined with a legume or can combine it with your wheat flour to make bhakri, chapati giving out more nutritionally packed recipe. It is advisable to keep a check on your carbohydrate and calorie intake in an entire day. Do not overboard. Have shorter and frequent meals.